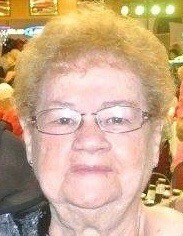 Roberta Mae Daluisio, 79, Peru, passed away at 4:59 a.m. on Wednesday, February 6, 2019, at Dukes Memorial Hospital, Peru. Born August 26, 1939, in Wabash County, Indiana, she was the daughter of Uriah “Sonny” and Mary L. Fites Weirick. On October 22, 1971, in Clarence, New York, she was married to Ralph John Daluisio, and he preceded her in death on November 18, 1996. She was a member of the Ebenezer United Methodist Church. She graduated from Gilead High School, and she worked for many years at the Miami County Recorder’s Office. She loved watching the Indiana Pacers with her neighbor, Velma. Survivors include one son, Kevin (Kimberly) Matyjasik, Franklinville, New York; five grandchildren, Beth Matyjasik, and Jarred Matyjasik, both of Arcade, New York; Brandy Englehardt, George Englehardt, and Ashley Englehardt, all of Franklinville, New York; fourteen great-grandchildren; and three sisters, Madonna (Don) McCombs, Sebring, Florida; Jennifer (Thomas) Daugherty, Amboy; and Mary Kaye (Kerny) Jones), Peru. She was preceded in death by her parents; one great-grandson, Jahvon St. Fleur; one sister, Shirley Creager. A funeral service will be held at 6:00 p.m. on Monday, February 11, 2019, at McClain Funeral Home, Denver, Indiana, with Pastor Tom Daugherty officiating. Visitation will be held from 3-6:00 p.m. on Monday, prior to the service at the funeral home. Private family burial will be in Ebenezer Cemetery, Macy. Memorial contributions may be made to Ebenezer United Methodist Church.